I love that thiss aopp is kid friendly. There are too many songs with explicit lyrics. Read on to find out how you can win a $50 Itunes Gift Card! I have found my new favorite app! If I could I'd shout from the rooftops for everyone to get this app on their devices. The name is fun, the functionality of the app is brilliant, it really is an app that anyone who loves music should have! Oh, you want to know what it's called so you can download it right away? Keep reading! 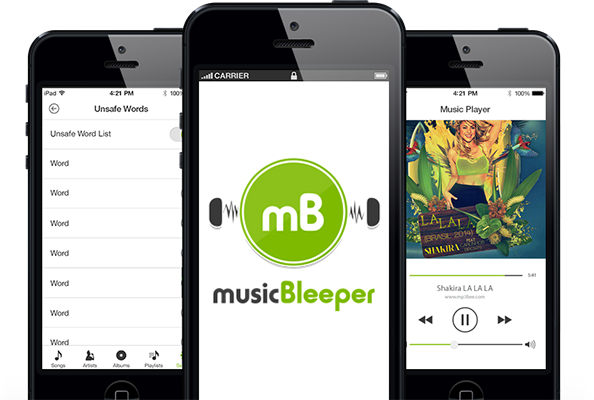 musicBleeper contains 91 words in PG-13, R and Religious-rated categories that you can eliminate based on your children's ages, or even your own religious affiliations, personal morals or family values. You choose the words you want to skip or silence. musicBleeper is password protected, so you can set the words you want eliminated, and no one can change them. The app can also be turned on and off, so you can listen to the regular version when you'd like. There are so many things to enjoy about this app. I love that my children cannot change the settings. The app is password protected, so I don't have to worry about my son jamming on the buttons and accidentally changing the settings. I've had to unlock my phone with my computer so many times, just to gain access, but he can't mess up this app! Also, I find this app very easy to use. You sign in, set the settings how you prefer them, and use the app. You can choose for the app to silence the word or skip it. I felt the silence was better for my phone. It sounded smoother. Nobody wants choppy music after all! I love the fact that we can filter out the language that we would find objectionable with this app. That I can monitor what my children hear! I love that it can be turned on and off, so you can listen to the regular version when you'd like. I like that you can control the words that you feel are inappropriate! Oh I really love that it filters out words you personally find objectionable in your music library!!!! This is great! I really love that you can choose the words it blocks out. My son loves listening to what we do on his ipad, but I can't let him listen to many because of the words. This definitely fixes that! I like filtering. It's a good thing. I know there is inappropriate music out there but I dont listen to it. I like the parental control though. You can filter the songs, thats awesome since I have kids. I like that I can control what my kids hear. I like that it can be turned on and off easily with the password so you can listen either way you want to. This is probably a great app, but I find it really sad that anyone or we as a society need it. If you're a parent and bleeping out words you don't want your kids to hear and then turning them on the listen yourself you're not setting an appropriate example. I find the fact that we as a society support these "artists" an example of how far we've devalued ourselves. I think it is cool you can set eliminate words you don't want your child to hear. I like that it censors music so my daughters don't repeat them, they're 2 and 4 years old after all. It's nice that you can pick some words you want bleeped in addition to the ones they chose. My favorite item I like about the app is that it censors out innapropriate words if you choose to use that option. I love that it will censor words that i pick and a list of pg13 words! i have an 8 yr old girl that loves pop music but says bad words bc theyre in the songs!! I love how it lets me control the words in my music. You get to choose the words bleeped! I don't like cuss words...so this is awesome! I like the control this gives to parents to monitor what feeds into young children's minds.